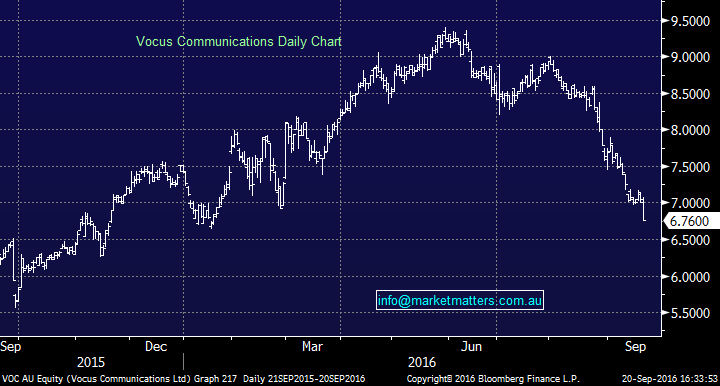 What happened to TPG Telecom? TPG Telecom (TPM) got whacked after releasing results that were in line with market expectations – however, they disappointed in terms of future guidance. The market sold them off by 21.56% on Tuesday, which also took Vocus (VOC) down by 3.64%. It’s just another example of the market getting too bullish on particular themes and pushing valuations to extremes. TPM was on 30 times FY16 earnings ahead of today’s result with a strong track record of under promising and over delivering - not the case today and the shares were sold off accordingly. 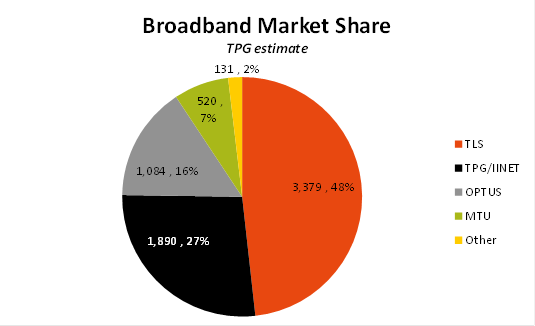 Read our analysis of TPG & Vocus below. The 21% drop in the share price is clearly BIG however when you think consensus earnings forecasts (EBITDA) for FY17 was sitting around $884m, and they guided to $820-$830m, that’s about a 7% miss plus we get a PE re-rating for the lower than expected future growth profile. The other major takeout was around capital expenditure which they reckon will be somewhere between $370-$420m – which is up from $281m last year. That said spending is being deployed into future capacity which is good for outer year earnings, but the market tends to focus on the shorter term. We saw a similar theme play out with CSL recently where higher investment into new products knocked around near-term earnings growth and the market sold the stock as a result. 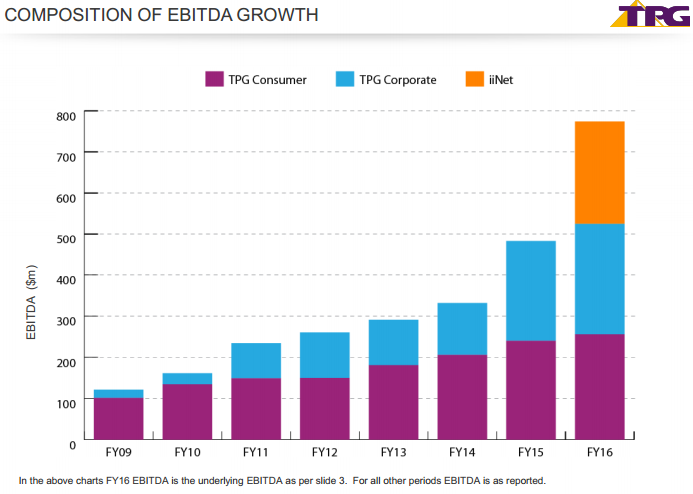 The composition of TPG’s growth is interesting, with the acquisition of iiNet shown below. Longer term subscribers of Market Matters would favourably recall the takeover of iiNett given we had a position in the stock at the time. Clearly, TPG has grown organically over the past seven years. However, the graph below shows that organic growth has slowed between FY15 & FY16 – and it’s simply the acquisition of iiNet that has had the most dramatic impact on earnings. It seems the period of very strong growth for these telco businesses is coming to an end, and the market has re-rated them accordingly. The next obvious growth opportunity is taking market share from Telstra (TLS) as part of the ‘NBN churn’, but this won’t be as easy as simply buying growth as we’ve seen in recent times. The obvious question is, at what multiple should these more mature businesses trade on while they bed down recent acquisitions? Both TPG and VOC have been re-rated. TPG now trades on 17 times FY18 while VOC is on 14 times FY18. TPG is the better business, with better margins and less churn of customers. However, Vocus is cheaper and has more levers to pull in terms of organic earnings growth. We might see some meddling with the numbers today post the TPG outlook, however, we still have VOC growing earnings by more than 25% in FY17. 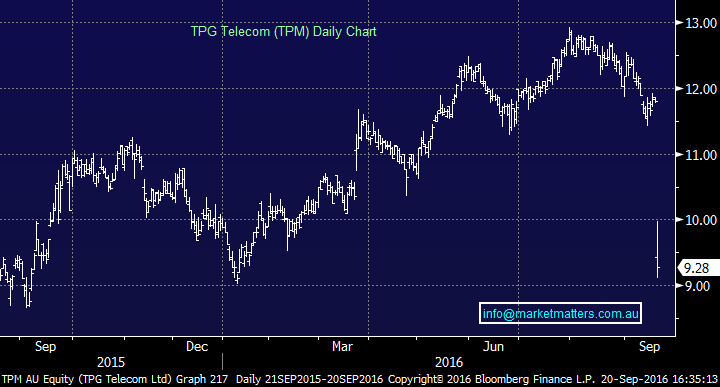 Based on today’s guidance, TPG will grow underlying earnings by just 6.4% in FY17. TPG made a high of $12.93 in August and today closed at $9.28; a drop of 28%. VOC made a high of $9.40 in May and today closed at $6.76; a drop of 28%. Clearly, both have come back to earth with a thud, and it’s interesting to think they’ve both dropped 28% to today’s close. Taking a step back and looking at Vocus trading at $6.76, with an underutilised network, weak margins and a clear growth opportunity with the NBN, we continue to think the near-term weakness presents an opportunity in that stock, while TPG still has some re-rating left in it! Thanks for sharing... an interesting read.